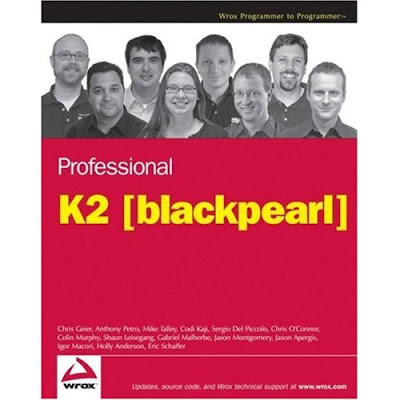 Get ready it is almost here, we have been writing Professional K2 blackpearl for Wrox. You can pre-order now on Amazon. I was just notified that it is going to the presses December 22nd and it will be available to customers January 15th. If you are a K2 professional, please consider getting this. Yes we had editors review our grammer. Hopefully we will give you a viewpoint from professionals who are implementing this for customers. Yours truly wrote the SmartObjects, InfoPath and Deployment chapters. Please buy it!!!! I am the second row; second guy from the left having a bad hair day! yes....you're next to the guy (me) who looks like he's saying "I think I can see my house from here!"